Afternoon: You will begin the trek up Hàm Rồng (Dragon’s Jaw) Mountain. There are several well tended flower gardens along the way. Going through two Heaven Gates, you will get the top of Ham Rong Mountain. Up here, you will have a sensational specticular views of the Hoàng Liên Sơn Mountains, including Vietnam’s highest peak – Mount Fanxipan. This is an enjoyable outing, but it’s not the north face of Everest so you will go down in time for dinner. Especially on Saturday night, we highly recommend a stop at the Love Market which is one of unique cultures of ethnic minorities (H’Mong, Dazo. 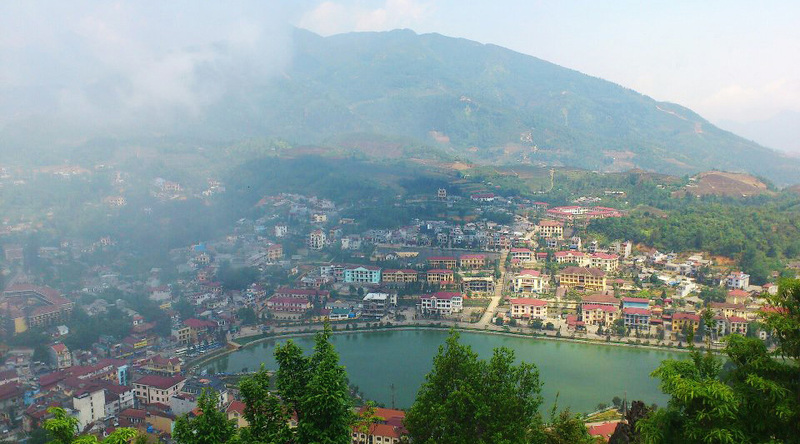 int Lao Cai in pacticular and Northwest of Vietnam in general. After breakfast, you will start trekking to Cat Cat Village which is occupied by the Black H’mong tribe. You will experience the tribal way of life while enjoying wonderful views of the terraced rice paddy fields and the waterfall in Cat Cat village. Coming here,you can see the hydroelectric power station which was built by the French in twentieth century. After that, you will go back to hotel to check out and be on time for lunch (11:00am – 12:00am). 16:00: It‘s time to say “Good bye Sa Pa!” and drive back to Hanoi. Have dinner at Lao Cai City then continue the journey to Hanoi. 22:00: We arrive in Ha Noi. End of services – see you next time!